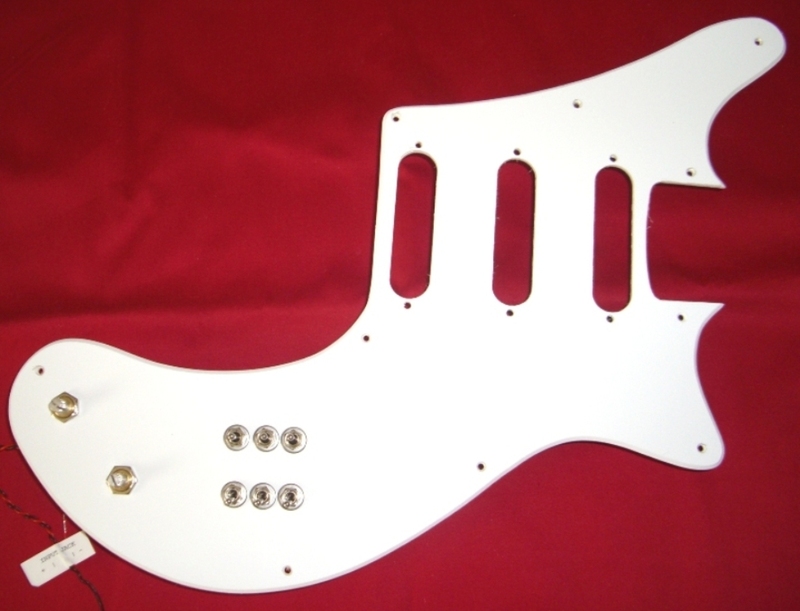 This is a White upgrade for your Brian May Red Special or BMG Special or Burns or similar guitar. This version is designed for Stratocaster style single coil pickups. It gives you 35 pickup tones on your guitar with three separate single-coil pickups. 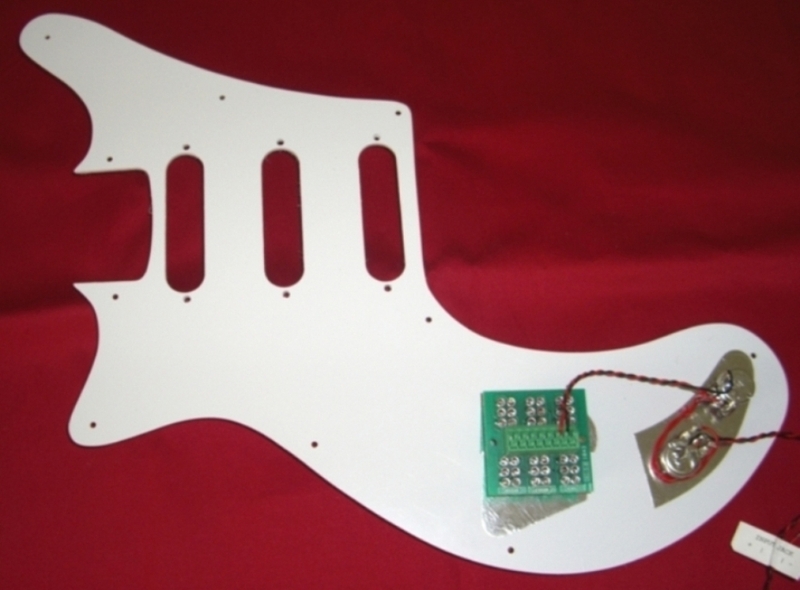 This pickguard is completely wired and contains our S3-Switch and VT-2 Volume-Tone Control Assembly. Everything you need to install this upgrade into your instrument is included. This EZ-install product has everything you need to upgrade your Brian May Red Special or BMG Special model guitar or similar instrument project and transform it into a Tone Tyrannosaurus. This will be the LAST upgrade you will ever need to make. After installing this upgrade, it will be your most favorite instrument of all time. Your stock guitar is designed to give you a modest and inadequate 13 pickup tones. Don't you think it's worth a few dollars more to get a Grand Canyon Wide range of 35 Blues, Jazz, Metal, Surf, Country  plus the dozens of new and different pickup tones your stock guitar simply cannot produce? This EZ Install high performance upgrade gives you the ultimate in performance at the lowest cost. any similar clone guitar model. This Brian May Red Special or BMG Special guitar upgrade is the ultimate in versatility because it lets you squeeze all the additional "hidden" pickup tones out of your upgraded guitar. Like your stock Brian May guitar, you can still put any two pickups On (in series, and either normal-phase or reverse-phase.) However, you can now turn On the third pickup in Parallel (either normal-phase or reverse-phase) and is something that your stock guitar could not do. Turn both the Bridge and Neck pickups On in normal-phase and in Parallel to sound like a "standard" Telecaster. And unlike a standard Telecaster, you can even put these two (or any two) pickups On together in reverse-phase to produce several variants of incredible glass-shattering country twang pickup tones  something you cannot do on your "stock" Brian May Red Special or BMG Special. You can turn each of the three pickups On (either separately or in any combination) at the same time in Parallel and normal-phase to make it sound like a "standard" Stratocaster  you cannot do this on your "stock" Brian May Red Special or BMG Special. You can even turn each of the three pickups On in Parallel and in either normal-phase or reverse-phase  something you cannot do on a standard Stratocaster  nor can you do this on your "stock" Brian May Red Special or BMG Special. Even better, this upgrade lets you put all three pickups On together in Parallel and in either normal-phase or reverse-phase to produce pickup tones that even a standard Stratocaster cannot produce. Can your your "stock" Brian May Red Special or BMG Special do these things? Put any/all pickups On in Parallel, either normal-phase or reverse-phase  you can't do this on your "stock" Brian May Red Special or BMG Special. Put any/all pickups in either Parallel or Series  impossible for you to do on your "stock" BMG Special guitar. You can turn any two pickups in Series, and the remaining pickup in parallel (either in normal-phase or reverse-phase)  something else you cannot do on your "stock" Brian May Red Special or BMG Special. Best of all, you will still have your original pickup tones, but after the upgrade you will have a total of 35 unique pickup tones. This upgrade is your ultimate "secret weapon." Used In The Studio, this upgrade gives you an incredible spectrum of pickup tones that are impossible to produce with your "stock" standard Brian May Red Special or BMG Special Guitar. Used On Stage, these upgrades gives you incredible Signature Sounds that nobody else can easily duplicate. You re-attach the upgrade and start exploring the 35 pickup tones now available to you. This page has MP3 sound clips to let you hear the result our T3-Switch upgrade offers you. 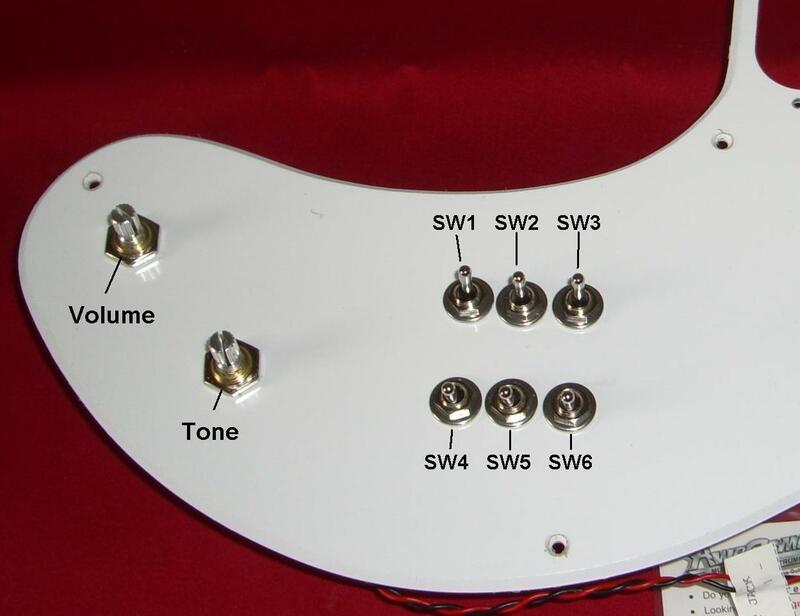 One White "Bare" upgrade for Brian May Red Special or BMG Special (or similar instrument) that comes with our S3-Switch, 500K quality Bourns controls without control knobs to give you 35 pickup tones. 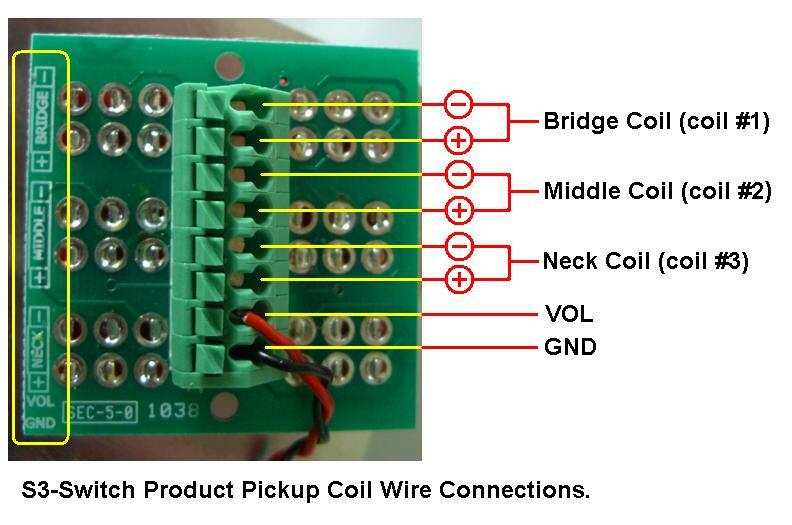 You use your Stratocaster style single coil pickups, installing them and connecting the pickup wires to the green solderless terminal strip and connect the two marked upgrade wires to your output jack wires. 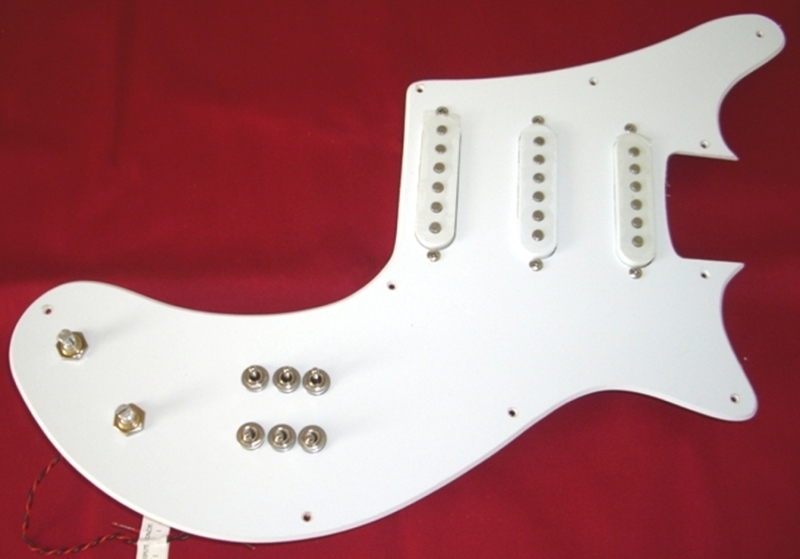 One White "Loaded" upgrade that includes our AweSome high performance ceramic single-coil Stratocaster style pickups. For Brian May Red Special or BMG Special (or similar instrument) that comes with our S3-Switch, 500K quality Bourns controls without control knobs to give you 35 pickup tones. You connect the two marked upgrade wires to your output jack wires. A parts bag with items you may need to install this product. This switching system cannot be directly> used with active (battery-powered) pickups or pizeo pickups.